I have written recently here about the duties of a PLC to give required information to allow a fair market in its shares, to inform investors and to prevent the possibility of “insider trading”. Rangers International Football Club PLC has made no Stock Market announcements since 24th April 2013. (I checked at 7.35 am today). Since then however the rumours and speculation have increased on a daily basis, yet no official comment has been issued. A Rangers spokesman was quoted in one media report (well, I am sure in many more, but one I have seen) saying that Rangers do not comment on speculation. If you look at the Stock Market page where its announcements are listed, we see one labelled “Response to Media Speculation” on 24th April and , just over a week earlier “Response to Media Comments”. Maybe not commenting on speculation is a new policy? But now, as Ecojon pointed out yesterday, matters are escalating. The Sun reported what it claimed were minutes of a board meeting of the PLC. These alleged that the non-executive Chairman, who has a vital role protecting the interests of shareholders as opposed to the executives, had lost a vote of confidence. The report also alleged that he had been given notice to quit earlier this year but avoided being removed by agreeing to step down – and then Mr Murray refused to step down. I suspect that such matters involving a PLC non-executive Chairman are highly relevant to the course of the company and potentially to its share price. Why is Mr Mather, the new interim CEO and now a Board member, not listed as such on the official Rangers website? Why is Mr Green still listed on the website as a Director and in the capacity of CEO? Whilst he may still be on the Board, he is not CEO, is he? We hear rumours that Walter Smith and other non-execs are considering “walking away”. Are these not worthy of comment? What about the sale of shares to the Easdales? Directors’ share dealings are meant to be disclosed. Even if strictly an agreement to see at a future stage is not something that MUST be reported, surely the proposed sale to two men who are vocal about getting a place on the Board themselves, and potentially buying up to 29.9% of the shares is something relevant to the market price? What about the Pinsent Masons/DeLoittes/Roy Martin QC report re dealings between Rangers employees and Craig Whyte? Rangers fan websites are chocked full of reports saying that the investigation has cleared Mr Green and Mr Ahmad of any wrongdoing. Surely this is price-sensitive data? Ought that to be disclosed, or if these are false rumours, some of them coming from people who seem to be “in the know” about dealings at Ibrox, shouldn’t this be made clear by Rangers? What about the departure of Mr Ahmad? In the prospectus as a Key Employee and then a non-person? The Stock Exchange rules do not require every rumour to be denied. However if information is potentially price sensitive, then the absence of a denial almost leads one to the conclusion that the comments are correct. It may of course be that every single one of the maters above is wrong. The purported minutes might be a fake or inaccurate. Mr Murray might not have been on the point of being forced out. He might not have said he was going to leave. He might not have faced a confidence vote. The Pinsent Masons report might be weeks from a conclusion. Mr Ahmad might have resigned to spend more time looking after his mother’s bank account. All of the non-execs might be in perfect harmony with the rest of the Board. As I mentioned before, it might be the view of Rangers advisers that, in fact, the shares are so lightly traded that there is no need to release statements on these matters, as there is not really a market to be affected. I bow to their NOMAD, Cenkos, on that one. But does it not all seem a bit of a mess? I have been told that concerns have been raised with the AIM regarding alleged issues of non-disclosure. As with many of these official investigations, if indeed my information is correct, it might take some time before matters are resolved. Does anyone fancy a bet on when the next regulatory announcement by Rangers will be issued? 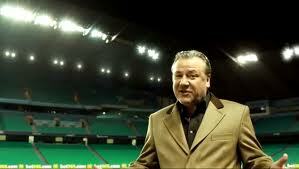 Where is Ray Winstone with the odds when we need him? He’s back behind the sofa, he heard there was a carrier bag with £40 grand there. I’ve already claimed that ! Let’s put that one on hold for a moment, now that Craig has released another audio clip and we must speculate as to who this mysterious ‘Brian’ might be. Could be more thrills and spills in the boardroom if the obvious guess is right. Reported in this morning’s Herald. Looks like the bug-eyed one is going to keep lobbing those hand-grenades in from behind the wall. ….AND I’M JUST HEARING SENSATIONAL NEWS COMING IN….! THE GOOGLE EYED SHYSTER RELEASES YET MORE PROOF THAT BIG CHUCK BLEW SMOKE UP IS BAHOOKIE…meanwhile in ecclefechan yesterday, a dug crossed the road Yip, it’s all happenin…. He’s not the Rangers Finance Chief – He’s a very naughty boy! My information,that i might have been told,that may be in fact factual or might be factually incorrect is, that due to special dispensation from the regulatory bodies, The Mighty(you see what i did there) Rangers Plc.WATP.com do not have to report on any speculation on their business affairs due to the local phenomenon known as sweetie wifing. This vagary in the FTSE,AIM,Dow Jones and Hang Seng markets is a by product of 18 months of destabilisation processes undergone by the Arty C BSometer. The weekly predictions from a lunatic in a bedsit in Carmyle and the non nuclear revelations from OG MacFudheid on a blog site originating from a mobile home on the A9 have been cited by the NEDS and city insiders,who, along with specialists in behavioural problems have came to the conclusion that normal stock market rules have to be suspended in this area. The case precedent of an anonymous member of the public waking up one day with an overwhelming desire to dedicate 18 months of his/her/their lives to achieve one aim and then disappearing, has led serious players in the city to suspect that something is truly rotten in the state of Obsession. Whataboutery and Mights,although a good company name for one of Mr Whyte’s new ventures,do not figure in the global conspiracy to reinstate a third division football team to it’s rightful position. Pay attention cam. The “sweetie wifing” by the Donegal prophet predicted Doom for Rangers. No amount of frantic arm waving on your part will redirect the juggernaut headed in Sevco’s direction. How long will the shields last? Ah Dinny know captain, there near tae breakin the noo. Only lunatic from Carmyle bedsitland is you ya muppet. Oh sorry nearly forgot…..Sir Cardigan of EBT was brought up there and was president of their diddy little bowling club. My city insider’s response to the escalation of matters in the case of The People v the people AD 1690-Current,is at this moment in the balance. Many wheelers and dealers are hanging fire until this behemoth of the financial world has properly digested Ecojons latest wet fart. At time of publication the laughter has still not subsided. Have you pished yourself today yet Leggo? What sort of announcement would you expect, Paul? “Ladies and gentlemen, this your captain speaking… It looks like we’re all doomed, please fasten your seat-belts”? Or, what if the crash has happened and we just don’t know about it yet: as you say, we seem to have lost all radio contact, in which case there’s not much point in advice on seat-belts. The fact that there doesn’t seem to be anyone around to make an announcement is indicative, I’d say. If you were a journalist, who would you even consider going to with basic questions about the state of affairs? Jabba is down in Greenock in a bus stop, taking instruction from his new master. Announcement will be released by Leggo in advance. Could it simply be that no-one left at Ibrox has the business accumem to keep up with stock market responsibilities? It’s not as daft as it sounds considering their previous antics. I’m sure the AIM will bring them to heel if things continue as they have. Of course, investors have no guarantees or security on the AIM. Best to cash in those shares now or it will be a weekend in Largs, not 2 weeks in Crete this year for the summer holidays. PS . If Foghorn Leghorn Green has signed a pre-sale agreement with the “McKrays” for his shareholdings, does he have to annouce that to the market, even though the transfer may be months down the line? The financial sector seemingly is awaiting the word of the Donegal prophet before making any moves. All has been quiet on the crystal ball front from Madame Philomena’s tent and the last sighting of the Irish? Nostrodamus was at a training session in deepest south Lanarkshire working on a new free kick routine.
. We as a new football club in Scotland’s lowest league, would like to clarify our position & standing in the game. 1) We are a new football club with 1 years history. 2) The only trophy we have won is the Scottish third division title. 3) we are in collusion with the SFA & SPL to be placed ( against the rules) into the top league asap. 4) as we did not have 3 years of audited accounts, we should not have been granted ANY licence to okay league football in Scotland. 5) We are the people. 6) ESPN had to apologise for our fans sectarian singing, we will not condemn our fans. 7) We will have an Orange day each year v Li field. 8) We had a player who was told by someone at the club, not to bless himself. We will not condemn or investigate this. 9) We are a disgrace. 10) We are the people. Play & Linfield to replace okay & Li field 🙂 in my post. After a night of intensive research and the usage of my new found s̶t̶r̶i̶k̶e̶t̶h̶r̶o̶u̶g̶h̶ bold italics technology i have by using an aggressive Turing based adaptation of 128 bit encryption algorithms,gone through the entire LNS, FTTT decisions and 5 way agreement and by cross referencing it with every word uttered in here over the last 18 months the only two words that remain untouched are,,,ball and sack. What this means is as yet unclear,but whilst i’m dreaming of the wonders of subliminal messaging in Word Press,i’ll no doubt make something up,,,good morning,,,zzzzz. I seem to remember a rather rabid response to rumour by James of Airdrie regarding the Orlit situation. Which if my memory serves me correctly is still unresolved. Cam – this is so insignificant it’s prompted you to write four reasonably lengthed posts in the space of less that 40 minutes. A vote of confidence, or not, does not need to be disclosed to the Stock Exchange. Rumours that Walter Smith may resign, do not need to be disclosed to the Stock Exchange. Confirmation that Charles Green is in fact leaving at the end of May as was previously disclosed, does not need to be disclosed to the Stock Exchange. And to finalise, a bit of whataboutery, why hasnt Celtic disclosed the rumours that their “key person” Neil Lennon might be leaving to join Everton? The answer is because true or not, they do not need to, of course. Whataboutery – non disclosure – dispute of the sale of the assets?? 2 different subjects. There is an ongoing investigation into those claims, which guess what……was disclosed to the Stock Exchange. Until there is a final outcome, no further notifications are required. What has been disclosed to the stock exchange; the fact that they did not disclose the assets dispute? It would appear that TRFC has only disclosed that they are investigating the veracity of their non disclosure. I know that you know that he knew what we know? @adam Because he has stated he has many great years to come at Celtic… FACT! Sally is pretty safe that there will be little movement for his services.. So you agree with me that no announcement to the Stock Exchange is needed. Good and thanks. @Adam deflect away mate, read: Lennon target for Everton, Stoke and now Leicester… Lazy journalism, No leaked docs, no photos of lennie with various other chairmen, not even a leaked tape conversation.. The man himself says categorically he has many years to come at celtic… Your alleged point is BS and has absolutely no substance and you know it….Celtic are used to the media’s ATTEMPTS at “disruptive and unsettling” tactics as we head toward a BIG game.. So in summary, you agree with me that there is no need for an announcement to the Stock Exchange to quash these silly rumours. However you know what i was saying and your dogmatism is a typical tactic of the followers of the rangers past and present. Adam, the only people desperately trying to punt lennon is the cringing Laptop Loyal. Why would Celtic waste their breath refuting desperate reporting like we see in Scotland? There is no way Lennon will be leaving. Once again, the situations are as different as night and day, no matter how hard you try and taint Celtic with the same brush, it simply won’t stick. Im not trying to taint or tar anything. Im factually pointing out that rumours or things that may happen do not need to be disclosed to the Stock Exchange. It would have been easier for you to say. You are correct Adam. Certain matters do require to be disclosed; especially when new shares are created by IPO (non disclosure of Green/Whyte dispute). Of course certain matters need to be disclosed. None of the ones i mention above do though. Adam, if you read the article properly, you will see that Paul points out that the stock exchange doe not require every rumor to be explained. What he is saying is that these rumors, if left unanswered , will lead people to draw their own conclusions. Clarification to ease any jumpy investors, should be the order of the day, especially when the club leaks sensitive information from every pore. Lennon has made it abundently clear he is looking forward to next year with Celtic, and another shot at the CPL. The rangers, on the other hand, have battened down the hatches and reverted back to the old siege mentality we saw all last year. And to think, the rangers actually employ Traynor, on a 6 figure salary as “Head of Communications”. Clearly, both parties have a completely different perspective of what that actually means. I think you may have speculated this thought before Paul but maybe they (football club board) don’t have to mention anything to the AIM as the holding club hasn’t changed personnel and it could be them who own the shares… OR maybe I just made that up..
A mess you say…!!! Football will kill the rangers when they are languishing mid table next season with the second highest wage bill in Scottish football and Miller, Boyd and Novo find they cant handle the Scottish 3rd Division’s teachers, postmen and white van men…. London Stock Exchange changes to appease Celtic fans. 14th May 09:00 – Response to blogger comments. RFC would like to confirm that contrary to comments on the internet, Leeds were liquidated. 14th May 09:00 – Response to blogger comments. RFC would like to confirm that contrary to comments on the internet, we are aware of the rules concerning over age players. 14th May 09:00 – Response to blogger comments. RFC would like to confirm that contrary to comments on the internet, the red band around our socks has nothing to do with blood. 14th May 09:01 – Response to blogger comments. RFC would like to confirm that contrary to comments on the internet, Bouncy Bouncy was sung by Rangers fans long before a completely unrelated incident that some people try to tar it with. 14th May 09:02 – Response to blogger comments. RFC would like to confirm that contrary to comments on the internet, we do have cash in the bank but we wont tell you how much. 14th May 09:03 – Response to blogger comments. RFC would like to confirm that contrary to comments on the internet, Charles Green cannot sell his shares until December. 14th May 09:04 – Response to blogger comments. RFC would like to confirm that contrary to comments on the internet, the guy who cuts the grass has never cut it in the shape of a sash. 14th May 09:05 – Response to blogger comments. RFC would like to confirm that contrary to comments on the internet, Eggs Benedict has never ever featured on any menu at Ibrox. 14th May 09:06 – Response to blogger comments. RFC would like to confirm that contrary to comments on the internet, the code for the lift to the Club Deck for our older supporters is not 1690. 14th May 09:07 – Response to blogger comments. RFC would like to confirm that contrary to comments on the internet, Neil Lennon and Ally McCoist are so over their wee spat that they are playing golf together in Portugal in a few weeks. 14th May 09:09 – Response to blogger comments. RFC would like to confirm that contrary to comments on the internet, Jim Traynor does not spend his day kidding on he is some other guy on the internet. 14th May 09:10- Response to blogger comments. RFC would like to confirm that contrary to comments on the internet, Ibrox Stadium has passed all the safety examinations. 14th May 09:11 – Response to blogger comments. RFC would like to confirm that contrary to comments on the internet, the assets transferred directly to Sevco Scotland. ariston and on and on and on…. Do you have any evidence of this libelous accusation ? Do you have any evidence to contradict this? Do you know how the legal system works? The production of evidence to support libelous claims is on the accuser. Until the next output from the Googley eyed one..!! Has someone confirmed that Whyte will not be spoken to ? Do you realise that unless an individual/organisation is specifically named no one has been libelled? @Adam hit a nerve mate? It was my attempt at humour which could be based on some fact and speculation. Im just asking if there is any more substance to what is an accusation of impropriety. The stuff put up the other day lacked substance. @adam has anyone confirmed he will be talked to… First off he has no legal responsibility to utter a word (if they seek an audience with him at all) AND why would he when he is clearly chasing a legal case on the matter.. There is no chance the man will reveal his hand until he has to, he knows the game, probably better than Chico pyro pants and I am sure he has the evidence to prove that. I’M NOWHERE NEAR APPEASED…….ONLY WHEN IBROX HAS IT’S LAST BRICK THROWN IN A SKIP, WILL I BE APPEASED….JUST! Cam and Adam, is there no soup kitchens down at the local masons where you “buroo wallahs” could go to at this time of the morning for a week haggis supper? Or do you have to wait until the goat has been serviced and fed? Found it curious Sevco weren’t drawn to play Celtic in either of the cups last year ( excluding Ramsdens)? I firmly believe if Celtic were in the same position Sevco find themselves, Celtic would have been drawn to play Rangers at Ibrox in both the cups! @Monti ‘Sieveco’ please… Soon to open up their own vegetable aisle at the rangers stores they don’t have (yet), place full of Leaks and Tumshies..
🙂 Get your coats to the cleaners Jim,no need of them now. I have asked in the past, ” Charles Green said he would be paying the Dundee utd share of gate receipts from the Sevco v Dundee utd Scottish cup tie, to Charity or charities” what charities have benefited and by how much? No answer yet! @Monti I fear we will need to wait ’til nearer year end before we rekindle the debate on the various charity black holes… Then again it was really only stated by Mr Pyro pants…. This was answered on Twitter by the charity involved. They got the money and thanked Rangers for it. I read the tweet myself. The charity confirmed it. You can believe me or not. A quick google reveals this. Erskine tweeted that they received it. Again, believe it or not. Of course you are. You are intolerant to anything that doesnt conform to your way of thinking. @Adam….. I’m not intolerant Adam, Rangers before & Sevco now are proven,lying bastards…..so why should I NOT be sceptical? Also Adam, you keep calling people intolerant, but you don’t accept people having a different view to you, which in itself is…INTOLERANT! Another 8 players for the rangers…. We Are the Paupers? Be interesting to see what Ally can achieve with journeymen – though the players being mentioned are still apparently well above Irn Bru 2 class and wage-level. What may be more interesting is to see how such a team (management and players) would fare in Div. 1 with Morton, Dundee, Livingstone, etc. – unless the budget is being held in reserve for the bug push. Oops – just re-read that and saw the typo – unless it was a Freudian slip under the influence of one Craig Whyte. Mc Murdo: Rangers’ inner business is being dragged out and touted to a salivating, Rangers-hating media only too keen to dish the dirt and “expose” the inner workings of Ibrox. Mc Murdo:Of course, what is really being exposed is a highly-embellished and extremely skewed version designed to make the “Green people” look bad and the “Rangers men” look good. Mc Murdo:Like many fans, I no longer buy the “Rangers men” bull – anyone who works to benefit the club is a Rangers man enough for me and I think Charles Green and others he brought on board have done plenty to fit that category. Mc Murdo:Sadly, Charles also brought Malcolm Murray to the club and it is his divisive antics that are causing most of the unrest. It doesn’t help that at least one former Rangers director is agitating on the outside, exacerbating the problem. Mc Murdo:With the imminent announcement of the Deloitte-led probe – likely to be a complete exoneration of Charles Green – this will heap immense pressure on Malcolm Murray to do what the board wish him to do and what he has already promised to do and that is to step down from his position. Old sticklebricks today… Well worth a good laugh at, tax dodgers and vat fraudsters to take over from shysters and conmen… Is this the start of Sally’s cleansing..? Read it earlier, could not make it up. On the one hand condemns Easdales but praises King for doing what both do best. @Paul i saw your post and it prompted me to check the auld looney’s site…Dodgy Dave or the McKrays (as someone posted earlier), tough call.. I am sure we will see their 5 year plan sometime…. Nice to see that you are up and so active after your long drive. However in the last post you raised an issue which I have responded to on the posts but as we have moved on I have repeated it here. Who said: ‘Im not being funny but the headline doesnt actually match the content’. I do realise you are a numbers man and have probs with the words and I should add I have never believed you understand humour going by the posts you make. However, because of these failings I will try and help you. I should make it clear that I mean’t the SFA info would only have been imparted to Rangers on the understanding it wasn’t publicly linked to the SFA. That ‘understanding’ would not have needed to be spelt-out – it isn’t done that way Adam as you are well aware. And, don’t forget, Green did say that he had intended to relevise Board Meetings – what a stroke of genius that would have been – even I would have paid my £5 quid to Rangers TV for episodes of that comedy. The club is a total utter shambles and ordinary Rangers fans must be wondering where it will all end and if Leggo sources in the Blue Room are correct – although I always thought he only had one – then Dave King is buying a controlling interest. You nearly always answer a question with a question. I think you do protesteth too much on some matters…..that leads me to believe you are on here to gather information for some peepul from the Masonic Cabals linked to this omnishambolic clusterfeck. 14th May 12:19 Response to blogger comments. Contrary to comments on the internet. RFC are not the deid club !? 14th May 12:20 Response to blogger comments. Contrary to comments on the internet.There is no rotund female vocalist preparing to perform at the front door..imminently. Question…. Can Chico Pyro pants get a restraining order or the like to stop the various Googley recordings hitting the meja/media sites? Interesting to see King back on the scene. Dementor in chief, Leggo, claims King’s reps are “in talks” with the SFA about an attempted take over at Ibrox. Suddenly, the hordes have gone from “Never again 1 man in charge” etc etc to cheering King to the rafters. Interesting when you consider he stated the authorities should not agree a CVA last year. Will be facinating to see what happens, especially if Green does sell out to the McKrays. I would not be surprised if the SFA are drafting legislation as we speak in order to drop totally the “Fit and Proper” criteria. Adam, if he does throw his hat in the ring, would you welcome him? I don’t see any level headed business man entertaining any deals at the moment until the cloud of deceit and intrigue has been lifted, mind you, the rolly poly brothers could prove otherwise. Agent Green should have reviewed his commander in chief before bringing him to the inner sanctum. Adam, what do you think is the best way forward? I would have thought that “fan power” through share ownership would be the the way to go, for the next 2 years at least. I feel that if who ever is running the show would just accept the reality of the club’s current position and cut the cloth accordingly, then many of the financial worries would disappear. Murray Park should be touted to the SFA has a national centre, shared with rangers. That way, you could at least have the costs split, while still having full use of the facilities. Otherwise, I fail to see how it can be kept open, with a full compliment of staff, with such a reduced revenue. Many of the problems seem to stem from the club refusing to down size in any way. Surely “saving face” is not as important as survival? Once rangers are knocking on the SPL door they can act the “Big time Charlie”. When you consider how little QOS spent to romp the 2nd Division, it should not be beyond rangers doing the same without taking the club back to the edge. I dont buy into the fans ownership model im afraid. Certainly not in Scotland. I agree that we should cut costs though and work our way back to the top. Its the only way in my opinion. Cast your minds back to when Celtic under MON were trying to get Neil Lennon signed from Leicester City when their then manager Brian Taylor wouldn’t allow him to go. The S.M.S.M were full of it with their ”No Chance of Celtic getting Neil Lennon”. and No Way Lennon is going to go to Celtic for chicken feed etc, etc. Now they can’t get rid of Lennon quick enough by linking him with every club in England in the hope that it will unsettle the Celtic family and maybe just maybe they may get rid of someone that they loathe and fear in a breath. The days of the toilet-roll ”newspapaers” being able to influence ANYTHING are long gone and if they don’t know it by now they will learn it when they are all signing on the brew soon enough! Thank God for the Celtic internet. Never been so informed in my life; and of course as we all know – knowledge is power.